Do you make treats for cats? We love getting this question at our events. Cats can be tricky to treat. Fun Fact: While humans have over 10,000 taste buds, dogs have less than 2,000 and cats have under 500. This could be one reason cats are harder treat than dogs. However, in our quest for knowledge and to connect with cat owners, we have asked them to try our Milo & Oats treats. Here is some of their feed back. We hope you enjoy their stories as much as we did! Please share your cat-verses-treats stories! We are very excited for our partnerships with two dog-centered businesses in Silverdale, WA and Seattle, WA. Silverdale Pet Grooming is focused on providing the best grooming experience and healthy options for dogs. They also share our value of supporting local businesses. Our healthy, soft treats will be shared with all their furry clients starting on August 20th. The Barking Lounge is an official Pick Up location for online treat orders from our website. Kora, our spokes-husky, loves to play at The Barking Lounge and we admire their partnership with Tragic to Magic Foundation, a company rescuing dogs from kill shelters in the southern USA and Mexico. The Barking Lounge fosters 2-3 dogs while they search for the pup's forever home. In celebration of each adoption, Puddles Barkery is giving a free Cake to the family who adopts one of these foster pups. Bandana: Just Fashion or Functional? Are you a crazy dog mom or dad? Yep, so are we! We love the grand array of colored bandanas can add just the right touch to our pup’s fashion style. While our pup is not a fan of full costumes, some dogs love them. Did you know that these stylish bandanas can be used to make your dog more comfortable as well? Our pup, Kora, always wears a bandana when we get ready to go. Whether it is for a hike or just a trip to the dog park, she knows that something fun is in store. However, it has a functional role to play: a wet bandana can help keep your pup cool on a hot day or during a hot hike. Much like humans, the moisture in the bandana will transfer to your dog’s skin and help cool them during their adventures. I think I can, I think I can… As your pup pulls you up one, two, three switchbacks, you may wonder if the view will be worth the trek. Here are a few of our favorite hikes with fantastic views on a clear summer day. Mount Pilchuk - On a clear day, you can see Seattle, Mt St Helens and many other majestic peaks from this lookout. There is a rock scramble and a ladder to get to the lookout, but the views around the base of the scramble are well worth the trek on their own. If you're climbing with friends, take turns doing the scramble as your pup may not be prepared for it. Rattlesnake Ridge - This is a very popular hike near the Seattle area and for good reason. While it is a steep trek with 2100 feet of elevation gain, it's also only 4 miles round trip. Plan on spending 2-4 hours for this hike depending on your pace. Even with clouds rolling along the top of this ridge, the views are great. You can see a blue-green lake and the Cascade mountain range. Poo Poo Point - While the view of Issaquah is pretty neat, it’s the view of the para-gliders that makes this view spectacular. It is a beautiful hike to a false peak and the main peak. From the false peak you can watch the para-gliders soar or stop by the main peak to see them take off! Why are (Other) Dog Biscuits Hard? Call it chemistry, because it’s true. The primary element that makes food soft is moisture. There is a careful balancing act as the amount of moisture also effects the shelf-stability of food. Soft foods are more perishable than dried-out foods. We believe a softer treat is worth the trade off. What does your pup think? To make a softer treat, we start with whole food ingredients. The baking process dries the treats, removing some of the moisture. After the treats are done baking, they are dried for a short time. Once the treats are cooled, they can be packaged and made ready for your refrigerator until your pup's next adventure. What is the SeaTac Pet-Con? 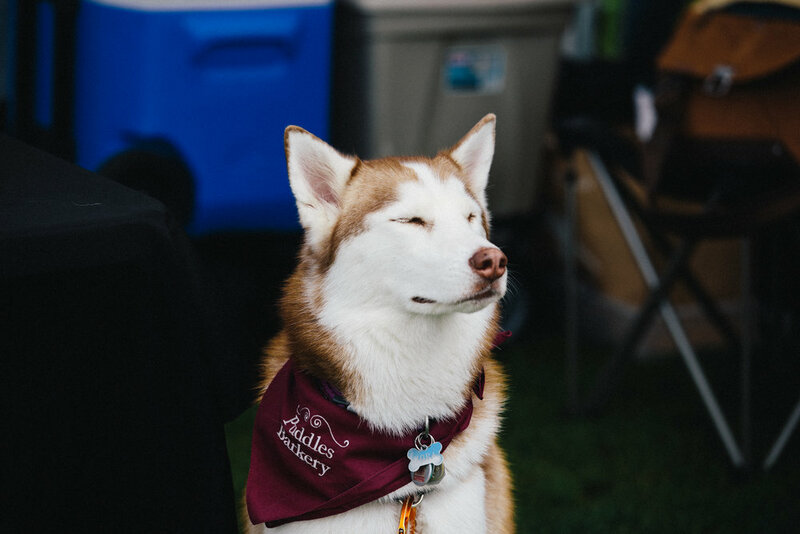 Think of a magical place where all the Seattle pups and their furry (or non-furry) friends can get together to experience an agility course, try the Diving Dock, watch a cat show, meet pet artists, and sample lots of new treats: that is the Seattle Pet-Con! It comes to town June 24th and 25th! Mark your calendars for this fun event and a day full of animals of all shapes and sizes at the Washington State Fairgrounds in Pullayup. We would love to meet you and your pup there. Who knows, maybe they will find their new favorite treat from us! Find more information on our events page or on their official site. Wheat allergies have become increasingly common in dogs. Some breeds are predisposed to food allergies, whether it's wheat or another base ingredient in dog food. Can I do anything to prevent allergies? Similar to human diets, diversity in your dog's diet can help prevent the development of food allergies. We rotate the main protein 3-4 times a year to introduce her to different types of proteins. Are you concerned that your dog has a food allergy? Keep an eye out for excessive licking or scratching near our pup's bottom. Your vet can also help you structure your pup's diet to test for allergies. Not all dogs are always treat motivated. This can create training challenges, like we faced with Kora. Our Husky is highly independent and she is also rather picky when it comes to treats. Because of this, plus her occasional lack of interest in treats, training is more difficult. One of the most helpful training techniques we learned from Heather with Ahimsa Dog Training was the Catch and Release. We used this technique, paired with her drive for exploration, to improve her recall. Next, we moved to the dog park. This highly distracting environment was a great place to practice calling her, having her come to us, "catching" her, praising her for coming and then releasing her to go play! While she still is independent, she has become infinitely better at recall. Your Dog Likes Toothbrush Time? Kora was not a fan of having her teeth brushed. To make this weekly task more desirable, we made toothbrush time into a reward. How does that work? We praise her and then she gets her bedtime treat. By making the experience like a trick, the process is not as bad as it could be. Additional note: The toothbrush bristles are hard when they are dry. So we first wet the brush and loosen the bristles with our finger before we put the new toothpaste on. Kora's Favorite Hikes: SNOW Edition! Many dogs enjoy the snow, but Huskies are extraordinarily excited about that cold, white, fluffy snow. We enjoy winter hikes whether we decide to go snowshoeing or to bring our microspikes to hike a snow-packed trail. Here are a few of Kora's favorites! Snow Lake is a great winter hike whether you stop at the ridge or if you continue down to the lake. This trail can be crowded because of its popularity (and proximity to Seattle). Be sure to share the trail! Lake 22 is a beautiful sight in the winter, but it gets cold quickly when you rest at the lake. Watch for your pup getting restless or switching paws on the ground to know when it's time to start walking again. Rattlesnake Mountain, or the trek to the Ledge, is another fun place to hike. When the sky is clear, there are some spectacular viewpoints. Leave No Trace: Pack it in, pack it out! The mountains, forests and lakes in the Pacific Northwest are amazing and it is up to us to keep it that way. To show your respect to nature and other hikers enjoying the views, remember to Leave No Trace by packing it out. Kora does her part too. Who do you think carries her own treats, her water bowl, some of her water and her poop?! Kora was gifted a dog backpack from our friends when we first started our hiking adventures. This pack worked for a while, but it was just a little too big for Kora's lean husky hips. While we were enjoying a Seattle Husky Runs meet-up, someone recommended Wolf Packs, an Oregon company with their own set of snow dogs, for her new pack. After some research, we decided they were the best choice for us. Kora sports a small blue Wolf Pack when we go hiking! The pack is very durable. It has seen plenty of rain, snow, water, mud and sunshine. However, the straps could not complete with Kora's teeth when she decided that it would work well as a chew toy one day… The Wolf Pack team was happy to help turn the chew toy back into a hiking pack. We shipped the pack with a small fee to their office to get the pack fixed. Their mascot even send us a little note telling Kora that there are better things to chew on, like a peanut butter kong! The pack was as good as new. It still is, as long as you don’t mind the souvenirs from hiking, crusty mud and dog hair. Becoming a dog owner can be a challenge. Especially when she is your first dog, ever. Especially if she is a husky. And especially if she likes to pull. When we adopted Kora, a 6-month old husky, we found out that she could not wait to see what was around the corner... She was always at the end of her leash. At first she only had a collar. But we soon understood that we needed some form of harness so she could pull (until she could be trained) without hurting herself. Thankfully, WonderWalker was introduced to us. This is a harness is a great fit for dogs who want to be at the end of their leash. It slips over your pup's head and clips around the waist. You can choose to use the ring in front of the dogs chest or on the ring on the dogs back. The ring in front suite Kora's walking style best. She sports a stylish pink harness. We were excited to see a change right away. How does it work? Any time Kora pulls, the harness would cause her to turn to the side and not pull straight back. This means no choking! The company is a local Seattle company with a great "damage policy." After we had the harness for a couple of weeks, Kora decided it would make it a great chew toy... We had not thought she would be able to reach her harness on the kitchen table; we were wrong. For only the cost of shipping, we sent the harness back to WonderWalker. The harness was fixed and returned it to us quickly. They were a lifesaver for us. 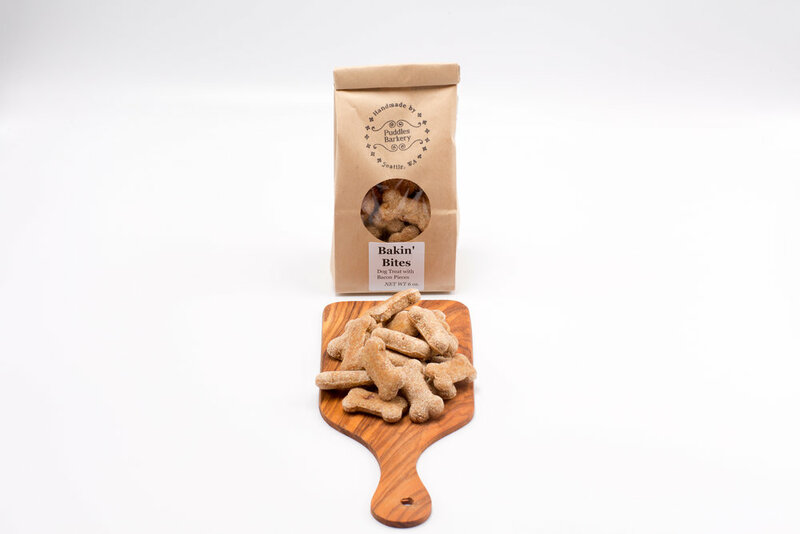 Puddles Barkery can stand behind WonderWalker because their product works and they have exceptional customer service. For the month of March, we are featuring the Cannoli. These delightful little treats are a sandwich of cream filling with peanut butter and chicken broth between two carob cookies. Kora volunteers to lick the beaters when making the cream filling. While Kora's thinks the Cannoli are tasty right out of the fridge, it is a special treat when we put them in the freezer. The filling becomes a cool treat after an afternoon at the dog park. We hope your favorite pup enjoys our treat of the month. As a Siberian Husky, she is expected to have her own opinion on just about anything and she is known to be picky when it comes to the type of treat she wants at the moment. There are so many things to do and see in the world so she is not always treat motivated, or is only motivated by a certain treat at times, she plays a large role in choosing the treats that we want to offer to our customers. With Kora, we have decided to follow a "nothing in life is free" model, which, in a nutshell, means that she has to do something before she gets rewarded. She knows to sit before we go out the door. She knows if she sits ad gives me her attention, she might get to go over to that awesome spot over there and sniff whatever is so fascinating. And she knows that if she does what we request - sit, shake, high five, spin, lie down, speak, etc. - she may get one of many delicious treats that we keep for her. While she is known to be picky, she may also get very excited when the treat in our hand is her favorite and she will start to do as many tricks as she can think of to get our attention... and the treat. It all started with a puppy. But not just any puppy, Kora is my very first pet. She is an adorable Siberian Husky with a mind of her own. And I wanted to spend as much time with her as I could. To do this, starting my own business seemed like a good start. Looking at my passions and strengths -singing, swimming, baking, cooking, psychology, and the enjoyment in sharing my passions with others- lead me to consider opening a dog bakery. Naturally, Kora had no problem becoming my official treat-tester. I am having a blast creating treats that she absolutely loves, like Milo & Otis, Mini Pup-Cakes with Cheddar and Carrot, and An-Apple-a-Day to name a few. It is amazingly cute to watch her spin around in circles three times in a row without even being asked, just because she knows I have one of her favorite treats. Sometimes she will do anything to get that treat. Seattle is a great place to start a food-based business. Local farms and other food producers pride themselves at having great products. The sense of community is best displayed in Seattle's Farmer's Market scene. I love having the opportunity to walk down the street on Market days and pick out some delicious produce and other tasty treats. Producing healthy treats with quality ingredients is a big priority. But so is making attractive, gourmet goodies for my companion. While you will find everyday treats at Puddles, you can also expect to find speciality treats for that extra special occasion. Between making unique treats, choosing a fun name, creating descriptions and perfecting the treats to look their best, it’s a great opportunity to let my creative side shine.